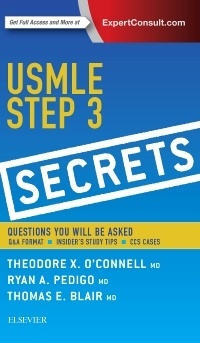 USMLE Step 3 Secrets O'Connell Theodore X., Blair Thomas E., Pedigo Ryan A.
Auteurs : O'Connell Theodore X., Blair Thomas E., Pedigo Ryan A. Clear that final USMLE hurdle with confidence! Bestselling review author Dr. Ted O'Connell prepares you for every aspect of the challenging USMLE Step 3 exam with questions and concise answers designed for today's residents. Following the popular, time-tested Secrets® format, this enjoyable, easy-to-read book is extremely effective for ensuring success on one of the most important exams you'll take in your medical career.